in Totnes in Devon and, as a ‘TQ9-er’, has already been caught not wearing socks. He supports Newcastle United football club and is a keen sportsman, having played football and rugby all his life. He worked as a chef before becoming a teacher and has an encyclopaedic knowledge of all things ‘foodie’. He is widely travelled, always keen to try out local delicacies, no matter how bizarre. Guy is an energetic teacher and an enthusiastic biologist. in Sociolinguistics. Upon graduating, Natalie taught English at the Université de Nice before returning to Glasgow to complete her Masters in Translation Studies. these institutions at events across the world. Yet, with every school visit, Natalie’s true vocation became increasingly apparent - the ‘best bit’ was always working with young people. She completed her PGCE (French and Spanish) at the University of Manchester, teaching at schools in Cheshire and the Peak District, before joining Hymers to be near family in York. Beyond the classroom, Natalie has three main loves: walks and cuddles with the family chocolate labrador, historical fiction, and Kevin de Bruyne. Born in Beverley, Garry was educated locally at Longcroft School before undertaking his degree in Fine Art at The Ruskin School of Drawing and Christ Church College, Oxford (1985). Garry also studied for an MA in Computer Animation, passing with distinction, at Teesside University (2003). 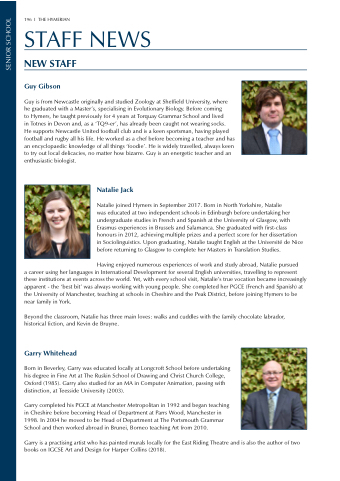 Garry completed his PGCE at Manchester Metropolitan in 1992 and began teaching in Cheshire before becoming Head of Department at Parrs Wood, Manchester in 1998. In 2004 he moved to be Head of Department at The Portsmouth Grammar School and then worked abroad in Brunei, Borneo teaching Art from 2010. Garry is a practising artist who has painted murals locally for the East Riding Theatre and is also the author of two books on IGCSE Art and Design for Harper Collins (2018).